Verbena is a Bayesian Inference tool for quantification of perfusion and other haemodynamic parameters from Dynamic Susceptibility Contrast perfusion MRI of the brain. 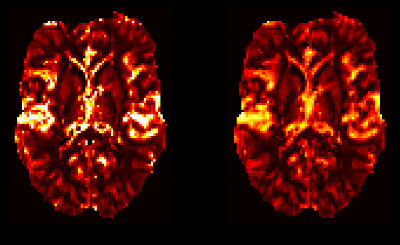 VERBENA complements the OXASL pipeline for the quantification of perfusion using Arterial Spin Labelling MRI and is built on the same core inference algorithm (FABBER). VERBENA uses a specific physiological model for capillary transit of contrast within the blood generally termed the ‘vascular model’ that was first described by Ostergaard (see below). In VERBENA the model has been extended to explicitly infer the mean transit time and also to optionally include correction for macro vascular contamination - contrast agent within arterial vessels - more information on the model can be found in the theory section. VERBENA takes a model-based approach to the analysis of DSC-MRI data in contrast to alternative ‘non-parametric’ approaches, that often use a Singular Value based Deconvolution to quantify perfusion. An alternative Bayesian Deconvolution approach is also available, but not currently distributed as part of FSL. For more information see the reference below and contact the senior author. VERBENA is included in FSL v6.0.1. If you use VERBENA in your research, please make sure that you reference Chappell et al . Mouridsen K, Friston K, Hjort N, Gyldensted L, Østergaard L, Kiebel S. Bayesian estimation of cerebral perfusion using a physiological model of microvasculature. NeuroImage 2006;33:570–579. doi: 10.1016/j.neuroimage.2006.06.015. Ostergaard L, Chesler D, Weisskoff R, Sorensen A, Rosen B. Modeling Cerebral Blood Flow and Flow Heterogeneity From Magnetic Resonance Residue Data. J Cereb Blood Flow Metab 1999;19:690–699. Mehndiratta A, MacIntosh BJ, Crane DE, Payne SJ, Chappell MA. A control point interpolation method for the non-parametric quantification of cerebral haemodynamics from dynamic susceptibility contrast MRI. NeuroImage 2013;64:560–570. doi: 10.1016/j.neuroimage.2012.08.083. © Copyright 2019, Martin Craig Revision 6765df66.